The Pennyroyal Herb Club Garden Tour is June 1 and will begin at the Ruby Laffoon Cabin. The Woven Coverlet Seminar and Workshop will be at the Byrnes Auditorium on June 8 beginning at 10 a.m. The speaker will be Richard Jeryan from The Henry Ford/Greenfield Village in Dearborn, Michigan. He will also evaluate any coverlets that folks want to bring to be displayed and evaluated. The June 13 program will be held at The Depot again and the speaker will be Madisonville native, Tom Rodgers who will be talking about Madisonville/Hopkins County Sports Trivia. 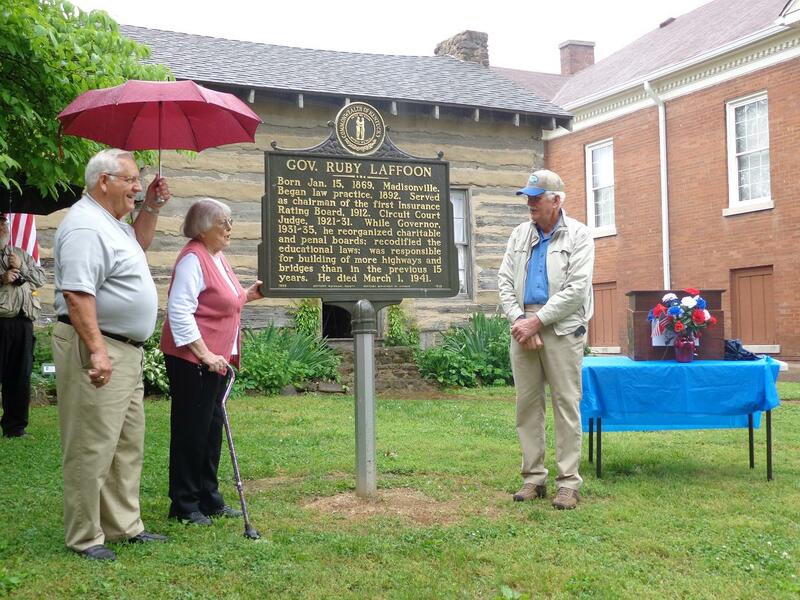 About 25 people who braved the weather to attend the Relocation Ceremony for the Ruby Laffoon Marker. Three descendents of Governor Laffoon were present: Frances Spain, Hugh Wayne Offutt, and Larry Smith. They helped uncover the marker. Also, Eloise Maloney donated “Cousin Mary Laffoon’s Iris” and the Pennyrile Herb Club, who take care of the Herb Garden around the Laffoon Cabin, planted the Iris in the front of the Cabin. It is a white Iris with purple edging. Currently the upstairs museum is closed to the public as inventory and rearrangement continues. Society members there is still time to volunteer and there are several hours of work needed before it can be set up for display again so remember many hands make light work.